CCTV is an acronym for Closed Circuit Television. Video cameras are used to record all television signals, but video cameras on a closed circuit system only provide the signal to a limited, specific number of television monitors. In some scenarios, such as casinos and retail stores, personnel are always monitoring and analyzing the video feed. In other cases, such as small businesses, the video feed is recorded onto a cassette tape or digital video recorder (DVR) and archived. Unless a crime or suspicious activity occurs, the archived footage is written over to make room for a new feed. CCTV has a variety of security purposes. While there has been opposition to "Big Brotherâ€™s watching eye," security cameras serve their purpose in society. Governments can use CCTV security cameras in highly congested areas to monitor traffic. Mass transit systems, such as subways, can make sure their loading docks are clear before taking off. GotCCTVSecurity.com is targeted to homes and businesses owners, so the debate over government spying won't be discussed ad nauseam. Intimidation â€“ The most obvious reason people and businesses implement CCTV security systems is for crime prevention. While this is not exactly measurable statistic, areas with a clearly visible security camera should deter the average criminal. Monitoring â€“ Businesses such as casinos consistently monitor their CCTV feed to catch cheaters in the act. Hot spots for cheating and stealing need consistent monitoring because the presence of a CCTV security system will not do much to deter the advanced criminal. Once they are caught in the act on tape, the video footage can be used catch them repeating the offence, or for prosecution in court. On the less extreme side of monitoring, we have applications that happen around the home. Video baby monitors are becoming more and more popular. They offer more piece of mind than audio baby monitors. If you are a parent with children, you can always place a hidden or covert CCTV camera in a discrete area. For example, if you just hired a new babysitter that you never used before. Crime Detection and Prosecution â€“ Whether or not your CCTV security system is monitored live by security personnel, the most measurable benefit comes after the fact. CCTV is commonly used in detection and prosecution. For instance, if a crime without any suspects happened within a business, a hidden CCTV camera could be set-up to try to catch a repeat offense. Or if a crime occurred that was caught on camera, the footage could be used to help catch and/or convict the people involved. A kidnappings caught on tape can gain national news coverage. Overall, if you are a person concerned about security, then a CCTV security system can provide the best bang for the buck depending on your needs. It would also make a great addition to an alarm system if you want to protect your home or merchandise. ADT has four interconnected monitoring centers staffed with professionally licensed safety-trained dispatchers. These four monitoring stations are directly connected with local police and fire departments to help ensure your safety. This complete network of monitoring centers operates 24/7 for your safety and convenience. When you have an ADT monitored security system installed in your Lexington SC home, the response times can be even faster than calling 911. ADT offers many different alarm system monitoring packages for every need. Through Home Security Lexington, you can get the basic monitoring package for only 36.99 per month, or about a dollar a day. For just a few dollars more, you can upgrade to the two-way voice system, which is ADT’s most popular monitoring package. With amazing pricing options, security has never been more affordable, so contact us now to learn more about ADT. Choose the system that best suits your needs, and you can take comfort in knowing that ADT has over 130 years of home security experience looking out for you every day. *With $99 customer installation charge and purchase of alarm monitoring. The average person ends up staying with the same security provider for about eight years, but with ADT, you will only need to sign a 3-year contract for a free home security system valued at $850. 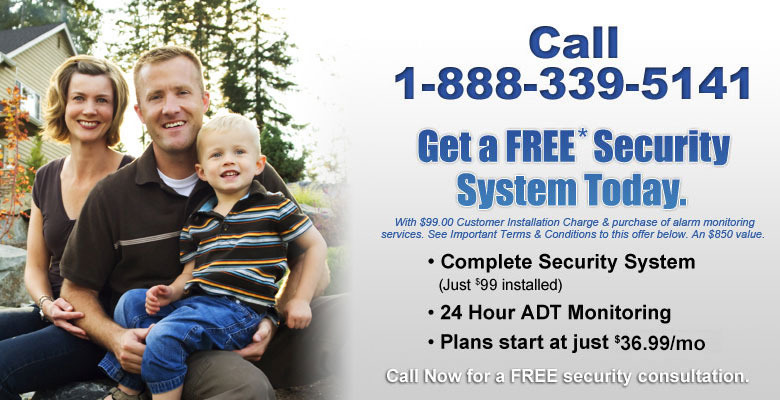 In addition, ADT’s professional installation will be free, and activation will only cost you $99. The ADT monitored home security system is simple and easy to use. The wireless keychain remote makes it almost effortless to arm and disarm your alarm system. The ADT professional installers take care of the setup and any questions you may have about your home security equipment at the time of install. The control panel has all your alarm system monitoring functions in one easily accessible location. Contact us today and ask how you can get your free ADT security system, valued at over $850. ADT Benefits include the 3 ADT guarantees*, fast response monitoring, and everything that makes ADT the #1 home security provider in America. Get local support in Lexington South Carolina. Store cash, jewelry, and other valuables in a safe or safety deposit box instead of leaving them exposed around your home. Many burglars will try to look like a police officer or a delivery person; make them read off the address on your “package” to see if they really are who they say they are. If they are not who they say they are, they probably will not know your address immediately. Reinforce doorframes and place multiple locks on all outside doors. Plant rosebushes or hedges in front of any windows that may be easy to break into. Install smoke alarms on every level of your home. Test them monthly to make sure they work. Replace the batteries yearly.